"We're quite familiar with the techniques of these modern artists," observes New York University anthropologist Randall White, who led the excavation in France's Vézère Valley. "But now we can confirm this form of image-making was already being practiced by Europe's earliest human culture, the Aurignacian." Pointillism, a painting technique in which small dots are used to create the illusion of a larger image, was developed in the 1880s. However, archaeologists have now found evidence of this technique thousands of years earlier—dating back more than 35,000 years. The findings appear in the journal Quaternary International. Major discoveries by White and his colleagues—which include images of mammoths and horses—confirm that a form of pointillism was used by the Aurignacian, the earliest modern human culture in Europe. These add weight to previous isolated discoveries, such as a rhinoceros, from the Grotte Chauvet in France, formed by the application of dozens of dots, first painted on the palm of the hand, and then transferred to the cave wall. 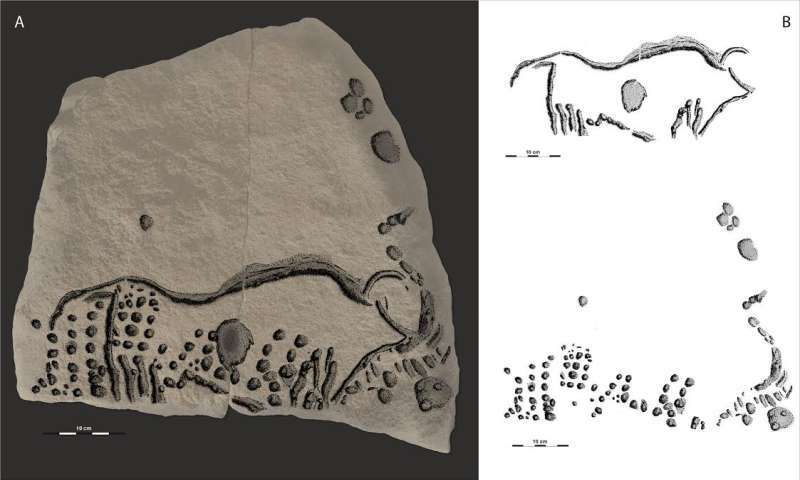 Newly discovered limestone slab from Abri Cellier with pointillist mammoth in profile view formed my dozens of individual punctuations and re-shaping of the natural edge of the block to conform to the animals head and back line. Credit: Photo and drawing by R. Bourrillon. Earlier this year, White's team reported the uncovering of a 38,000-year-old pointillist image of an aurochs or wild cow—a finding that marks some of the earliest known graphic imagery found in Western Eurasia and offers insights into the nature of modern humans during this period. Now, in short order they have found another pointillist image—this time of a woolly mammoth—in a rock shelter of the same period known as Abri Cellier located near the previous find-site of Abri Blanchard. Abri Cellier has long been on archeologists' short-list of major art-bearing sites attributed to the European Aurignacian. Excavations in 1927 yielded 15 engraved and/or pierced limestone blocks that have served as a key point of reference for the study of Aurignacian art in the region. In 2014, White and his colleagues returned to Cellier, seeking intact deposits that would allow a better understanding of the archaeological sequence at the site and its relationship to other Aurignacian sites. They had their fingers crossed that the new excavation might yield new engraved images in context, but nothing prepared them for the discovery of the 16 stone blocks detailed in the Quaternary International article. One of these, broken in half prehistorically, was found in place with a radiocarbon date of 38,000 years ago. Remarkably, the remaining 15 blocks, including the pointillist mammoth, one of three mammoth figures recognized during the new work at Cellier, had been left on-site by the 1927 excavators. As many of the engraved traces are rudimentary and thus difficult to interpret, the original excavators set them aside just in case they might have something inscribed on them. 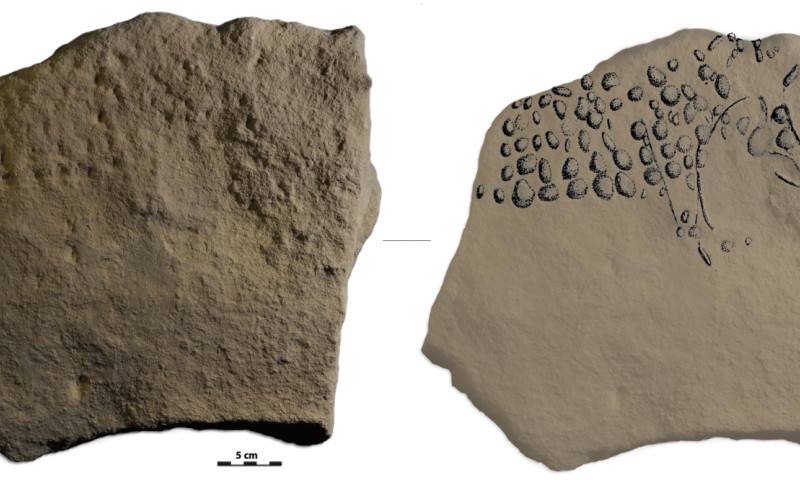 The new article presents evidence that the 38,000 year date for the newly excavated engraving also applies to the new trove and to the other blocks found in 1927 and now housed in the French National Prehistory Museum. Over the past decade, with these and other discoveries, White and his team have increased our known sample of the earliest graphic arts in southwestern France by 40 percent. The team includes researchers from the University of Arizona, the University of Toronto, the University of Toulouse, Paris' Museum of Natural History, and the University of Oxford.